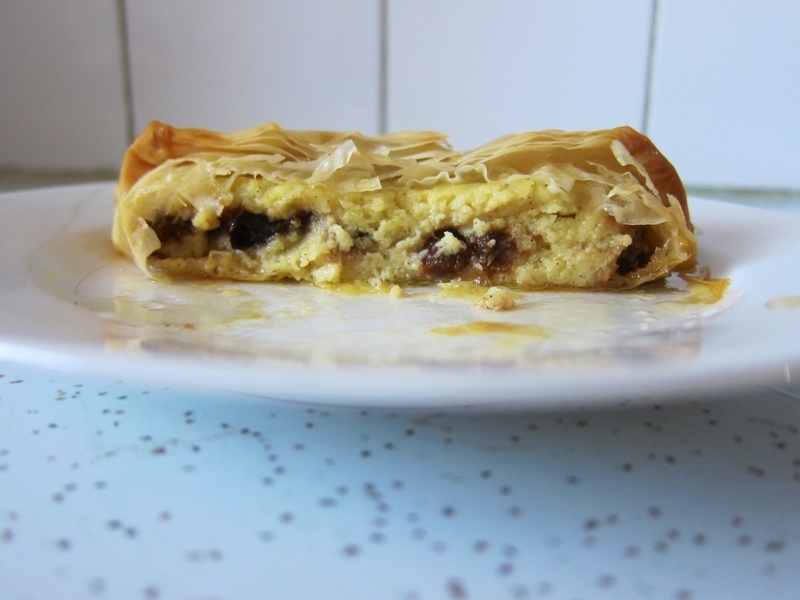 On the subject of indulgence there are few better recipes to get the tastebuds firing than one that begins: "...a slab of semolina custard baked inside thin pastry and drizzled with honey." Bougatsa is a traditional breakfast pastry that originates from the Macedonian region of northern Greece. With its crisp flakes of buttery filo and baked semolina custard that is beautifully perfumed with vanilla and orange, it is a simple yet decadent pastry typically enjoyed warm with a drizzle of honey and a sprinkling of cinnamon. Sweet, sticky, oozy and rich; the Bougatsa has the right balance of flavours and textures to cover the spectrum of sensory indulgence, while being just messy enough to leave you feeling adequately wicked. Of course being custard, I may have embellished a little by throwing in a few Armagnac prunes, but then that's precisely the point of indulgence, isn't it? Place the sugar and water in a saucepan over medium heat and slowly bring to a boil. Simmer for 1 minute then transfer to a bowl and allow to cool. Add the prunes and Armagnac and leave to macerate for at least 4 hours. In a large saucepan combine milk, cream, vanilla pod and seeds, orange peel and a pinch of salt a place over medium heat. Bring to a boil, remove from the heat straight away and leave to infuse for 30 minutes. Return the milk to the heat, and while it's warming up put the sugar, semolina, whole egg and egg yolks in a large heatproof bowl. 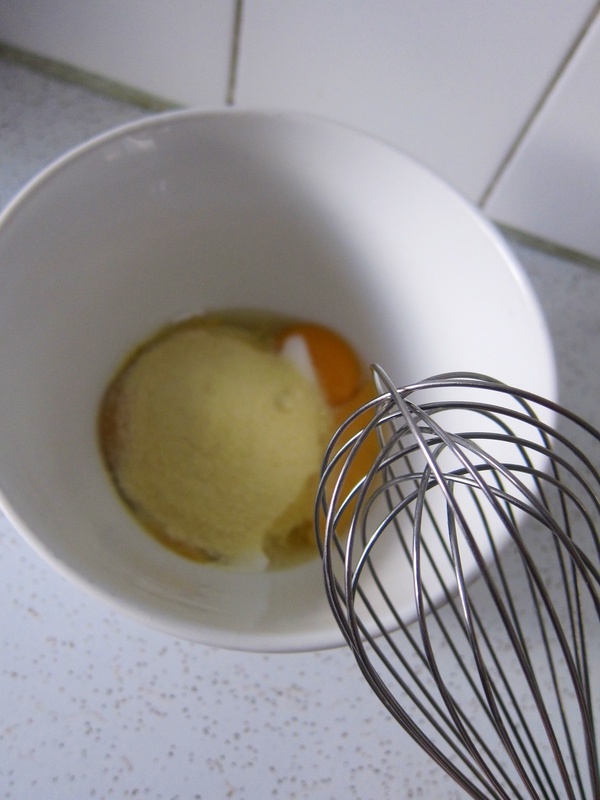 Whisk the egg mix to combine, and when the milk is hot slowly whisk it into the bowl in a steady stream. Tip the mixture back into the saucepan and cook, stirring over a low heat for 12-14 minutes, until very thick. Remove and discard the vanilla pod and orange peel, and whisk in the diced butter. Pour half the mix into a square-ish dish or tray and layer with the Armagnac-steeped prunes (you will need around half the recipe listed above). Pour over the remaining custard and leave to cool. Cover and put in the fridge to set for three hours, or overnight. Heat the oven to 180°C. Cut the custard into four even squares: don't worry if they are not perfectly firm. Place one sheet of filo on a clean surface and brush with butter. 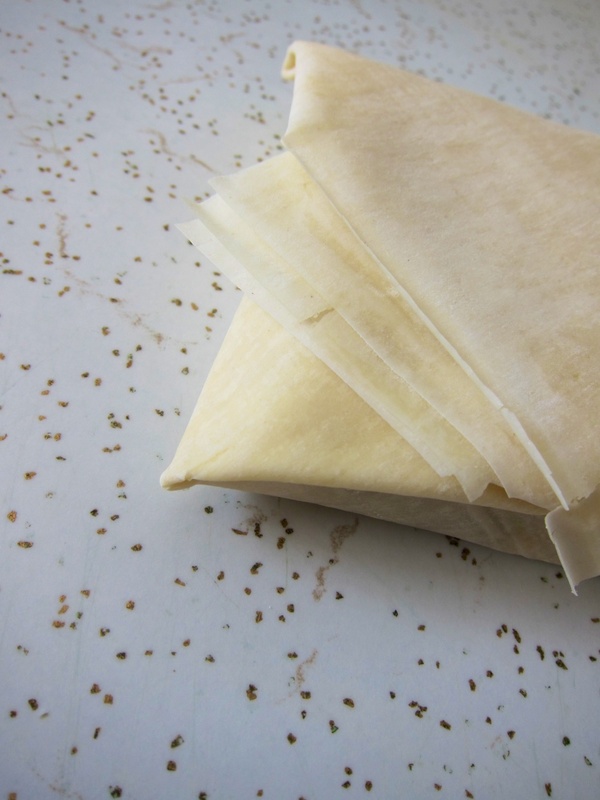 Lay another sheet of filo on top and brush it, too, with butter. Repeat with a third and fourth layer of filo. 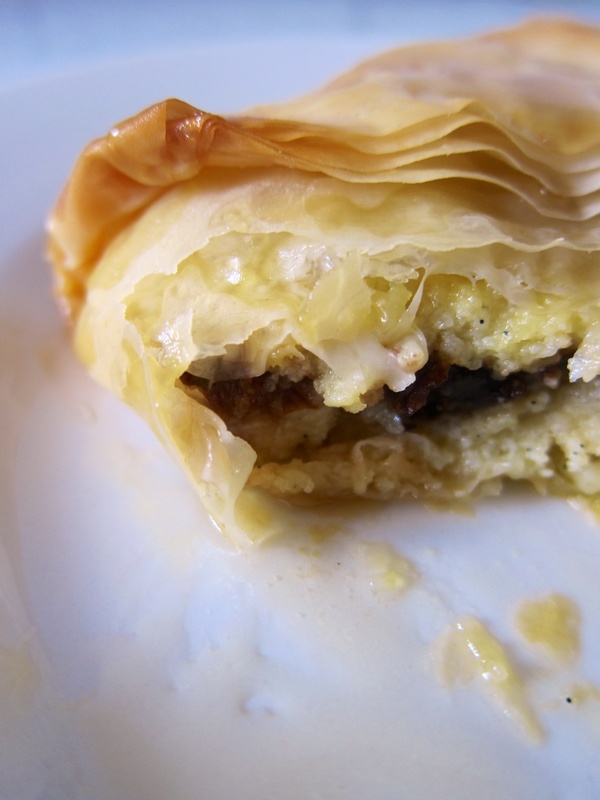 Place a square of custard in the centre of the filo, at a 45-degree angle to the pastry, lift up a corner of filo and fold it up and over the custard. 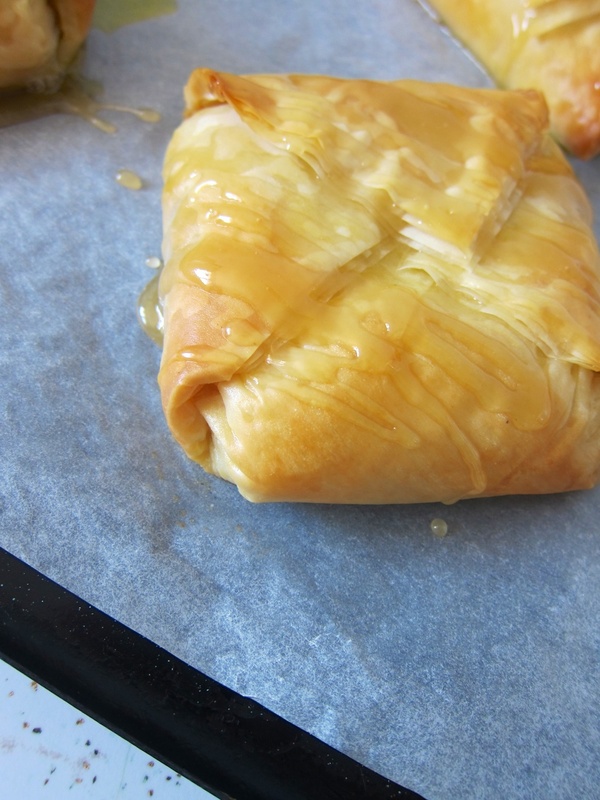 Draw up the opposite corner, so you have an envelope of custard encased in filo. 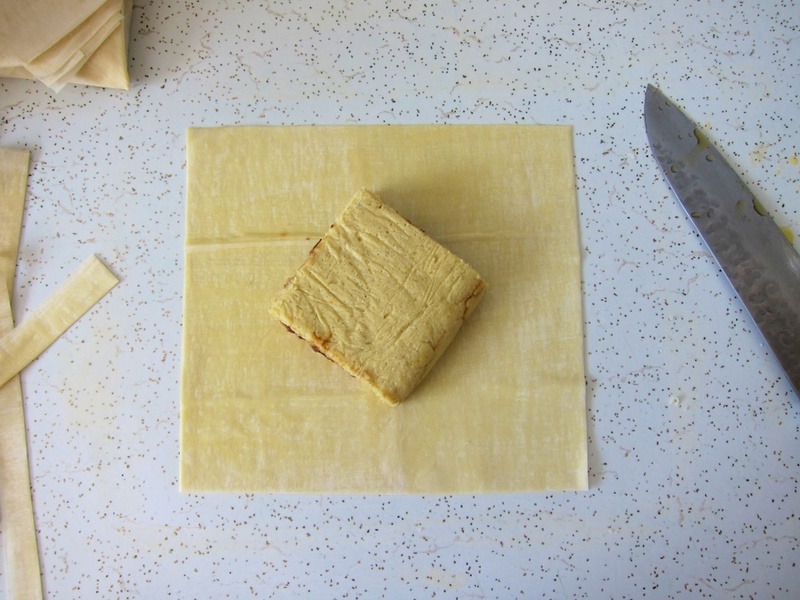 Butter the top and place folded side up on a parchment-lined baking tray. Repeat with the remaining pastry and custard, then bake for 25 minutes, until the tops are golden brown. Drizzle the bougatsa with honey while they're still warm and sprinkle with cinnamon. Serve warm or at room temperature.